Are you interested in learning about and applying the natural and powerful abilities of the deepest part of your mind to support yourself and others? Do you feel that there may be ways to speed positive shifts in habits, thoughts, feelings and behaviours – whether in your personal or professional life – and would like to discover the key to unlock that change? Would you like to add tools to support your clients/customers in your existing work, or explore a valuable and profitable vocation where you can ‘do well and do good’ right away, upon graduation? Is your goal to feel comfortable and confident in using mind power not only to understand others and be able to help transformation, but feel greater contentment, increased energy, better health and focus, enhanced relationships, and deeper peace of mind? Hypnosis works. we know. This is what we do. And our goal in training is to teach you what we’ve been doing, so successfully, for years. 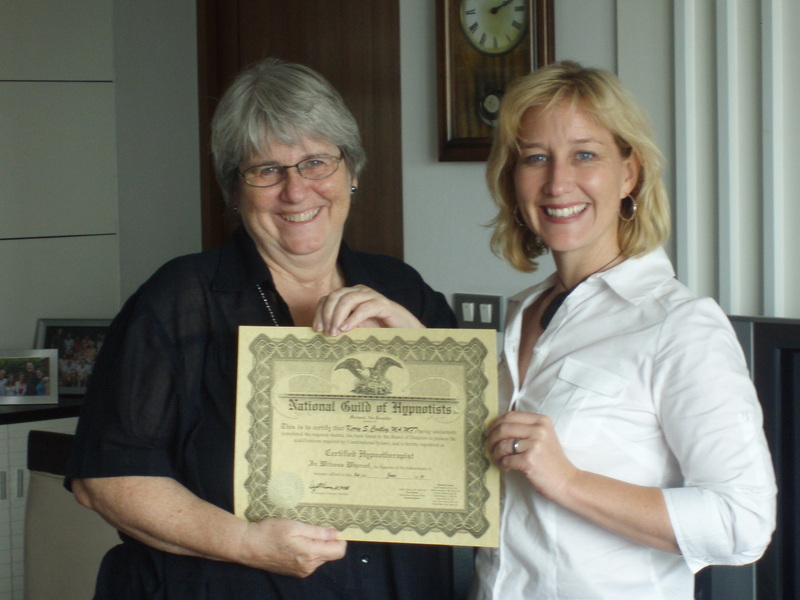 “I can confidently say that attending Jennifer Norris-Nielsen’s “Professional Hypnotherapy Certification Training” has definitely been one of the most life-changing events I have experienced.” Amimo A. Our ten-day hypnotherapy program is led by Grey Matter Network’s Jennifer Norris-Nielsen, with the experience in the field of over 15 years and thousands of clients, combined with certification by the National Guild of Hypnotists (NGH), the world’s largest and oldest certifying body for our profession. Starting from the very beginning (no prior experience necessary) students are guided in the important theory of the subconscious mind and its potential for change. With each step along the learning journey, students can experience hands-on application and practice – one of the surest ways to build confidence and competence in gaining knowledge that will be available to you for life. You’ll first understand the workings of the mind, the basics of hypnotizing including various inductions, deepening and emerging techniques, and grasp the foundations of suggestions and metaphors. Then we’ll move to more application of these techniques to help others in changing negative habits, increase health and wellbeing, and move towards positive goals. We’ll explore various types of clients, including children and teens, and the wonderful shifts made possible with the right tools. Positive change isn’t only for others, as we’ll be spending time on developing easy and effective ways to use self-hypnosis to achieve your aspirations and dreams as well. As the course progresses, your understanding and assurance increases as well, and we’ll move on to deeper exploration of metaphors as well as advanced therapeutic techniques including Age Regression, Empty Chair Therapy and Parts Therapy, among others. You’ll explore emotional facial recognition that will give you additional tools to help others more effectively. All of these we’ll practice and support within the classroom environment. The course also covers logistics and business help, so you can bring your therapeutic skills out to the world successfully. Whether it is in a full- or part-time practice, or as an adjunct to an existing career or focus, we want our graduates to ‘do well and do good’! Our accredited hypnosis training program prepares you for the next step in your life, no matter what it may be. Not only do you have the training and backing of Grey Matter Network’s international association, but with successful completion of training and testing, are eligible to become a Certified Hypnotherapist (CH) with the National Guild of Hypnotists (NGH). All materials and certifications are included in the course. Until September 15th, save $750, and receive a valuable bundle of additional materials (worth hundreds) – this investment pays back in all aspects of life. Now only S$4425! The earlier you sign up, the more bonuses you get (we love supporting change and decisions right away). Sign up with a friend and you’ll get valuable materials worth hundreds more! SO Much to Cover in an Intense TEN Days of Learning! Want a taste of some of the subjects we’ll be covering? There are many reasons why successful individuals, people who are interested in enhancing their lives and knowledge like you are, decide to take Our Hypnotherapy Certification. This is what we do. Period. Jennifer Norris-Nielsen and all support trainers are full-time Hypnotherapists with experience. With over 15 years in Counselling and Hypnotherapy, seeing thousands of individual and corporate clients, and speaking at professional symposia around the world, Jennifer is the Hypnotherapist’s Hypnotherapist. We do it because we believe in it and use it every day. So all of our training is committed to helping you do this amazing and transformational work. We remember starting out, and have included “if I’d only known then what I know now” shortcuts so you don’t have to reinvent the wheel. Ever felt like you wish you’d have an owner’s manual for parts of your life? Grey Matter Network’s training course includes an avalanche of usable scripts, handouts, forms and outlines, so you don’t have to start from scratch, making it easier to focus on implementing the skills you learn in class. We like results. And we like others to be successful. This isn’t a lead course that requires you to take another one just to be able to perform in the real world. We give you a ‘foundation plus’ so that you can start seeing clients right away, serving them well and with confidence, and seeing positive results even before you graduate. Our course seem to attract a special type of person, and our classes have always been full of dynamic, generous and bright individuals who have contributed to the learning experience, supporting success for the future of our graduates. Your tuition includes all the material you need – manuals, scripts, marketing, business support, audios, videos – including the tips and ‘secrets’ to successful practice in this field. We don’t use pressure tactics for our students – we just like to keep our classes to a size where we can give you personal attention and you can learn at your best. You don’t want to miss your opportunity and seat. You can decide to shift your life for good (before September 15th and join with a friend, and you’ll get bonuses listed below) – SIGN UP WITH PAYPAL NOW we’ll get more information and send extras once you join! Technical Trouble? Please email us if something is not working for you – we’ll sort it out to make sure you can join us! 1. Support people you care about make the changes they need or feel better physically, emotionally and mentally. 2. Enhance your own ability to feel calm, full of energy, focused, optimistic and directed, and to increase your own well-being. 3. Boost your current career or influence within your job and social circles. 4. Move to a flexible and rewarding vocation that allows you to 'do well and do good', adding value to your life and the lives of others. Whether for professional or personal reasons (or both), hypnosis training helps you to "Work. Play. Love. Live. Better."